Last January, I overhauled my model portfolios to make them simpler. Some of the older options included small-cap stocks, preferred shares, and real estate investment trusts (REITs), but I switched to recommending a three-ETF portfolio covering only the core asset classes. While many readers welcomed the change, several others criticized the new streamlined portfolios as too simplistic. I still get emails from beginners who want to add more ETFs to my recommended model. Simplicity, it seems, is a hard sell. Create a buffer between your portfolio and your emotions. Carlson cites a study that found people ate three times as much chocolate when the treats were right in front of them, compared with when they had to walk a short distance to get one. In the same way, he says, “You have to force yourself to find a way to create that short distance between yourself and your investment decisions.” Maybe that means training yourself not to check your portfolio value every day, or even every week or month. @Rik: Thanks for the comment. I’m not sure what I could say in a blog post that I didn’t say in the article you linked. The main idea here is that there is no fundamental difference between a pre-retirement and retirement portfolio. The level of risk will likely change, and you may need to set up the portfolio to dispense a certain amount of cash flow each year (with a GIC ladder, for example, as explained in the article) but there is no reason you could not use one of the model portfolios at any stage of life. One other important point: once an investor gets to retirement, the portfolio is likely to be larger, there will be more accounts, and there will be tax implications to consider. At this point DIY is less likely to be a great option. @Keyboardhero: The takeaway from Faber’s finding (that diversified portfolios performed similarly over the very long term, but very differently over shorter periods) is not that you need to choose your strategy based on your time horizon. You need to adjust your asset mix (risk level) based on your time horizon, but that’s not the same thing. Faber was simply trying to argue that investors tend to get caught up in finding the perfect strategy (he looked at several published portfolios) but in the end the details matter much less than the overall commitment to diversification, low cost and discipline. And if you change horses in the middle of the stream, you will probably drown. I think we need to make the distinction between different financial plans and different investing strategies. A 20-year-old and a 60-year-old do not have the same goals and would not have the same plan. But both could use variations of the same investing strategy (such as a balanced index portfolio), simply adjusting for different risk levels. Same with the 45-year-old in Alberta: assuming he has a suitable index portfolio I’m not sure why he would be encouraged to find a different strategy (or avoid rebalancing) because we happen to be experiencing a bear market in Canadian equities. I’m leaning towards applying a one fund solution using the Tangerine Investment Funds. I love this series of funds because it forces a hands-off approach. From what I’ve learned, we’re our own worst enemy when it comes to investing. Successful investing seems to have to do more with emotional intelligence than pure intellect. Question 1: The Tangerine Investment Funds apparently rebalance quarterly, yet it seems to earn comparable returns to a basic Couch Potato portfolio that rebalances only once per year. Doesn’t the amount of times and when a portfolio is rebalanced affect returns relative to another similar passive account with a different rebalancing strategy? Question 2: Jack Bogle apparently believes ‘rebalancing is a personal choice, not a choice that statistics can validate.’ If that is the case, shouldn’t I save a few bucks in MER fees and choose some cheaper balanced funds like BMO BALANCED ETF or CIBC BALANCED INDEX PREMIUM instead of using the classic Couch approach with rebalancing? I love this site and Money Sense magazine too. I hope someone finds the time to answer my questions. At my old company, I had my group rrsp and company dpsp contributions divided almost equally across a US, Canadian, and International mutual fund. I annualized 11-12% internal rate of return for five years. I say simple it is. New company will take a while to get those numbers, so working on the best the etf combo now that I’ve moved the funds to a brokerage account. @Luciano: I can offer some light on question #2. I think you are unclear as to the concept of balancing. Balancing in the context of Couch Potato Investing (Passive Index Investing) merely means periodically rearranging the proportions of your asset allocations if they have drifted too far away from your previously assigned proportions, to get them back to your planned proportional allocations. It is a part of risk management, to keep your assets within the proportional limits you have previously decided, hopefully after a lot of soul searching, that you think you can live with. It is not necessarily a strategy for increasing returns, although that usually happens incidentally. I don’t understand your thinking in “trying to save a few bucks in MER fees and choose some cheaper balanced funds…” Are you thinking that you are saving money by not (re-)balancing? And that by purchasing funds that say they are “Balanced” they will do the “balancing” for you? If that is the case, then you should understand that these funds you name are using “Balanced” in a slightly different sense. The BMO fund you name is an actively managed mutual fund and calls itself “Balanced” because it allocates a mix of assets that it hopes is “balanced”, and which changes all the time, according to what they think might be a good idea, and which is not necessarily what you would choose. In fact it is unlikely to, because hopefully you would adhere to the concept of a fixed asset allocation that you can live with and which doesn’t change with every market shift or whim of the latest prognosticating gurus. This fund charges an MER of 1.72%, so I’m not sure what you are comparing this rather pricy MER to. The CIBC fund is a mutual fund and apparently is actively managed. Its MER is 0.39% which is not particularly high, but, again, the fund being actively managed would be contrary to the principles of rational Passive Index Investing, i.e. not prime Couch Potato terroir. It’s not so much that you are not following the classic Couch Potato approach to rebalancing, but rather you are not grasping the fundamental CP principle of first examining, then choosing for yourself what you can live with, and then ensuring that your subsequent investment plan keeps your investment mix within your pre-determined asset allocations. Your other plan works only if you don’t have an idea of a predetermined mix that needs to be kept within comfortable limits, and whatever they do is ok with you, assuming the MER is ok with you. @Benoit: I’m sure Dan will have a significantly more eloquent way to answer your question. Firstly – these passive funds simply follow an index. The indexes vary slightly (i.e. XIC follows S&P/TSX Capped Composite, VCN follows FTSE) but are essentially interchangeable. There is always a slight lag of the index but given the relative simplicity of simply matching an index, it is generally very small (and published on each provider’s page). Given the recommended ETFs are all very “core” and not niche products, they are not likely to be changed or cancelled (most have a lot of assets under management – XIC has almost $2 billion, VCN (much newer) has $350 million). Secondly – the ETF provider does not own the assets under management (Dan probably has a better technical explanation regarding this). If a ETF provider (bank/Vanguard/iShares) goes bankrupt, my understanding is that the ETF would probably be cashed out at the NAV. It would trigger capital gains and other costs for those of us who own the ETF, but we would not lose all the value of the underlying stocks if the ETF provider goes bankrupt. It is also very unlikely (given the huge size of Vanguard , iShares, and the Canadian bank providers). I think there may be some reasons to choose one provider over another, but I don’t think we need to diversity our ETF providers for the reasons you specify. Vanguard in particular is relatively unique in that Vanguard is owned by its funds and therefore owned by us (who own their funds). That makes them relatively stable and completely ETF focused. I suppose we could potentially see some of the banks getting out of the ETF business given the race to the extremely low MERs we see, but something like XIC (with a 0.05% MER) is still able to generate about $99 MILLION dollars in management fees with their assets under management (let alone XSP at $3 billion in assets and 0.10% MER = $300 MILLION). I would be significantly more worried about some of the mutual fund companies – in the era of decreasing returns, extremely low ETF fees, and an increasing interest in DIY investment and especially roboadvisors, they are likely to have a rough road ahead. People are getting wise to the silliness of 3% MER with trailer fees and they are probably mostly coasting on inertia at this point. Thanks as always for the blog, Dan. I am slowly transitioning to the 3-fund allocation although still struggle a bit with asset allocation between TFSA, RRSP, personal and a CCPC account! Are you going to look at HBB in more details – I have it in my CCPC account. You suggested taking a “wait and see” approach back in 2014, do you think it is reasonable in a taxable account, or not really worth the effort? @Luciano: Rebalancing can boost returns over some periods, but it is primarily a risk management tool. For example, if you built a plan around a strategy of 60% equities and 40% bonds and your portfolio has drifted to 70% equities, then you are no longer taking an appropriate amount of risk and you should rebalance back to your target. @Craig: Thanks for your response to Benoit. Regarding HBB, it seems to have tracked its index extremely well since its launch, so if you are comfortable with the structure then it would seem to be a good choice. I will also be looking at ZDB as soon as the full tax information has been published for 2015. One problem I see with the 3 fund solution is asset allocation. Just as Amus holds all funds in both TFSA and RRSP and that is not optimal, it seems that holding everything ex-Canada in both TFSA, RRSP and non-registered accounts is not optimal. This is the *only* thing holding me back from making my portfolio simpler. Maybe also the occasional bonus from rebalancing as I add new money when one particular asset is down (say, Canadian funds). @Jamie: The model portfolios are designed as a “good enough” solution for those who don’t know where to begin. No model portfolio can account for an individual investor’s ideal asset location. If you are managing multiple accounts, including taxable accounts, it may indeed make sense to use a more complex portfolio. 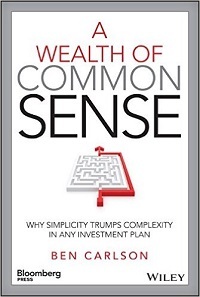 I have just finished reading Carlson’s book and I agree that it is one of the best that I have read in years. So good! After finishing it, I found myself re-reading parts for the second time over…that rarely happens. Definitely one to keep on the shelf for those volatile times when I need to settle my “investing nerves”. I think we need a Canadian version and that Dan is just the guy to write it! As per the paper you and Justin wrote on foreign withholding taxes the cost of the TD e-series international index fund in a TFSA is actually lower than XEF and VDU. Wouldn’t be better and simpler to buy the TD MF in this case? The ETF MERs have changed a little bit since you wrote the paper, so this difference may have changed as well. @Julio: There may be some confusion here, because XEF has changed its structure since our paper was written. It was originally a “wrap” fund with an underlying US-listed ETF, but now it holds the stocks directly and is therefore a better choice in a TFSA. As for VDU, I believe its MER has gone done somewhat since the paper was written, but it still uses the same tax-inefficient wrap structure. The e-Series funds would likely be an equivalent or perhaps slightly better choice in terms of FWT, but of course these are only available to TD clients. Do you have a previous post that talks about these tax inefficient “wrap” structures, and why they are more inefficient than etfs holding stocks directly? Much appreciated, and thanks for the education. Hi Dan. So up to 3 year under couch potato approach, and have no regrets plus I sleep better, so thanks. As I go along new question pop to make sure I am fully optimising the process. Is this something I should be including in my balancing act? @Jean Francois: Some people believe that asset allocation should be measured after accounting for the tax on withdrawals (e.g. $100K in foreign equities in an RRSP is treated differently from $100K in the same asset class in a non-registered account, because the former is taxable). I am not aware of any portfolio managers who do this, because it can be extraordinary complicated. It also completely ignores the behavioral component of asset allocation (I’m pretty sure you will feel just as bad to see your RRSP fall in value as you would to watch your non-registered fall by the same amount). Any good financial plan takes full account of the taxable consequences of withdrawals from retirement accounts, so it’s not necessary in any case. @CCP thanks. The link is awesome, is probably what i needed to actually introduce a taxation part in my balance. I was worried that i was actually being too conservative implicitly (my fixed income NET% was at 40% instead of target 35%), and i think this is correct. As for behaviour, I actually expect my RRSP to have higher variability since it includes way more equity, so that’s not an issue. Hi Guys – I have what i think is a simple question but do not see the answer. I have been good about putting money into my RRSP and TFSA but it is pretty much sitting there in cash. I want to adopt this simply portfolio. However, say I buy VCX now (which holds a lot of USD stock). I would be buying with a low Canadian dollar. When the Canadian dollar increases, this will lower my return – regardless of how the individual stocks behave. BTW, I am 43 so still have a long time horizon and i have about 80K in cash in my 2 accts. me again – reading thru old commenst, i see my concerns are addressed. I just wanted to thank you for your blog. It caused me to take a hard look at my RRSP portfolio. I originally had it in a self-directed RSP at TD Waterhouse where I followed no particular plan and had bits and pieces of whatever struck my magpie fancy (like the gold mining company that went completely bust…). Not good. In 2002, I was convinced to move it to an advisor and a portfolio entirely of a mix of income and equity mutual funds. Good. And I adopted a hands-off approach and didn’t do any selling-off in the various downturns between 2002 and 2015. (I simply adopted a practice of not even looking at my quarterly statements, which made it easy to not stress about what my funds were doing…) Even better. Unfortunately, the place I put my money was Investors Group … and when I looked over my portfolio after reading your blog, I found that I was in some of its worst-performing funds to boot — which isn’t surprising because they were the ones with the highest MERs. I am now back in a self-directed RSP at TD Waterhouse and this time in a Couch Potato portfolio adjusted for my personal risk tolerance and split initially between 4 TD e-funds and now gradually moving into the 3 Vanguard ETFs (VAB,VCN,and VXC) (for some reason, I have become quite obsessive about MERs…). I would never have realized just how badly I was being burned at IG without your blog. @John: Thanks so much for comment. I’m happy to hear that you’ve been able to extract yourself from high-fee funds. Good luck with the new self-directed portfolio! I think I just came up with a new saying “The unsuspecting investor is the a happy investor”. When I read the Ben Carson mentioning that you should distance yourself emotionally from your investments I couldn’t agree more. I myself am not a huge investor, but whenever I have some extra disposable income I’ll invest in some mutual funds, GICs, stocks, options, whatever has me excited at the time, and to be quite frank I usually forget about them. Most of the time I just end up having pleasant surprises about how much money I actually have and how well (at least in my opinion) my investments are doing. So I think I’m that unsuspecting investor which ends up being happier than most :) Great post by the way. Do you find this asset allocation also reasonable/acceptable, compared to the 33%/33%/33% in your model portfolios? @Jas: I think that’s a perfectly reasonable alternative. There is no perfect formula here. But I do believe a strictly market-cap=weight strategy (3% or 4% to Canada) is too low, and the all-too-common 90% to 100% Canada is too much. I have been following you for years. Your thoughts on investing have been behind many of my investment decisions. That said, I have found it hard to stay true to the index investing position. At the start of the year I set up ten on-paper only portfolios in order to compare the actual rewards of various investment approaches. Starting with approximately $700,000 my Assertive Couch Potato Portfolio using TD-e series funds stands at $739,343.73 today. My assertive portfolio using Vanguard ETFs had done a little better and stands at $751,300.17. But the simple portfolio that has done the best is one which places the bulk of its holdings in the TD Monthly Income D-series fund, another big wollop of money is in the TD U.S. Monthly Income $C D-series fund. A little (maybe 15%) was divided between ZRE and XUT to pump up the dividend income. This last portfolio stand at $780,285.68 today. And what portfolio that I follow has done the best? My own. In January, I removed more than 3% from my portfolio in order to live in retirement and I am still up some 2% over my best faux portfolio. So, if my own portfolio is doing so well, why am I still looking longingly at a simpler portfolio? The answer is easy: volatility. In a serious market downturn, I see my portfolio wilting big time. I’m sure funds like the TD Monthly Income ones will prove far more resistant to the downward pressures – both have oodles of bonds. And your Couch Potato approaches should performed better in a serious correction as well. You are always careful to hold ample money invested in bond funds or ETFs. So, why do you not consider a couple of funds, like the TD ones I am using in my test portfolios, for inclusion in one of your Couch Potato creations? @rockinonldn: I don’t include the ID Monthly Income Funds in my model portfolios because they’re actively managed funds and therefore not compatible with the strategy. Let’s remember too that it is not helpful to evaluate a long-term strategy over a period of 11 months.